You Can Run a Marathon! 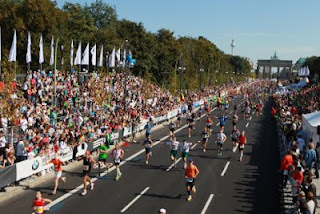 : Berlin Marathon in Less Than Two Months! July seems to have really gotten away from me this year! I have still been out running and am really enjoying my 17:30 run every Monday evening where I run with others. We add an extra kilometer each week which is really working out well. Once we get into the middle of August I'm going to add an extra 5k or so onto the distance just for myself and use the Monday training for my long runs. I'm nearly half way through my running coaching of my beginners group and it's going very well. They are surprised at how much fitter they feel now compared to just 6 weeks ago!